There are so many complicated ways to cook. All kinds of techniques, recipes which take you hours and hours of preparation. You know what? I maybe like to eat them, but not to cook them. AT ALL. For me cooking shall be easy, down to earth and no problem to prepare. And what I love most is spontanious cooking with what you have at home. As I leave to Austria tomorrow, I had a lot of veggies to use up from my visit to the farmer’s market last week. Gosh – and it was so worth it! For the second day in a row I made a vegetarian meal, which was so easy and tasty – just perfect for my taste, that I want at least to share one with you. Ingredients: veggies whatever your fridge gives you. I used 6 potatoes with the skin, a big piece of pumpkin, 2 carrots, 1 green pepper. Also works fine with any other vegetable like tomatoes, fennel, sweet potatoes, mushrooms etc. For seasoning: rosmary, oregano, olive oil, sea, salt and pepper. Method: preheat the oven to the max (220°C), chop up the veggies in bite-sized pieces and put them in one large or two smaller oven-proof dishes. Drizzle with olive oil and season with rosmary, oregano, salt and pepper. Also add some garlic and pieces of onion if you like. Cover the dishes with a double layer of aluminium foil and bake it for approx. 1 hour. Then take them out, take away the foil and put them back into the oven to make them crunchy and brown for another 20min or so. Prepare the dip in the meantime. For the dip: half of a box of cream cheese (I like Philadelphia light), fresh herbs like parsley and coreander, some sundried tomatoes (in oil, not the Maltese salty ones, they are just too salty for my taste), salt and pepper, a bit of olive oil & milk to make it creamy. P.S. 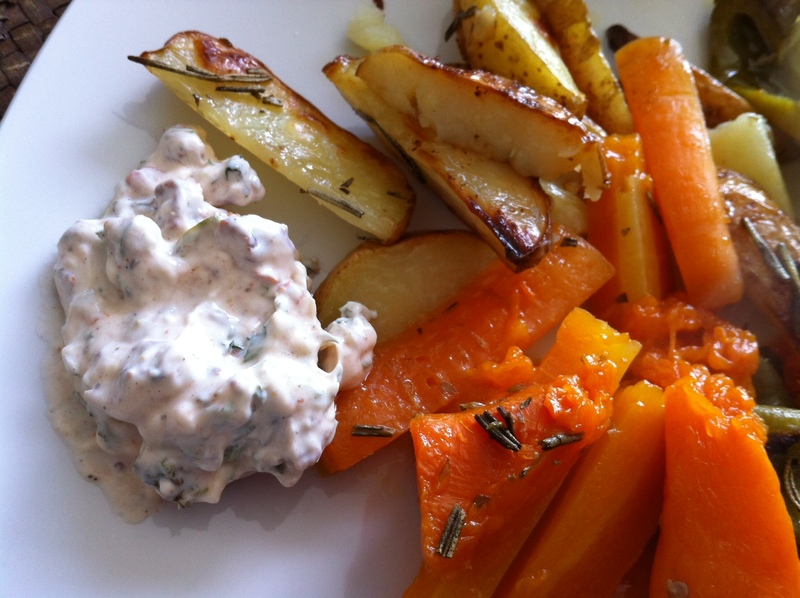 If you have leftovers, the cold roasted veggies also taste lovely on top of a salad or as a kind of cold antipasti. we’ve been cooking with a lot of veggies lately… i always try to experiment with what’s in season which makes the cooking more diversified, too! read the mouse over text of each image to get details on the regarding dish….